The premier ICT exhibition Infotel 2018 organised by the Federation of Information Technology Industry Sri Lanka (FITIS) was officially launched at the Kingsbury Hotel in Colombo recently. The biggest and most prestigious Information and Communication Technology (ICT) exhibition in Sri Lanka and the whole of South Asia, Infotel 2018 will be held from 2 to 4 November, at the Bandaranaike Memorial International Conference Hall (BMICH) in Colombo. The theme of this year’s exhibition will be ‘Towards a Digital Economy’. FITIS’s objective is to align with the national objective of the IT industry to increase Sri Lanka’s IT and IT Enabled Services (ITES) exports to $ 5 billion, while providing employment to 200,000 by 2022. 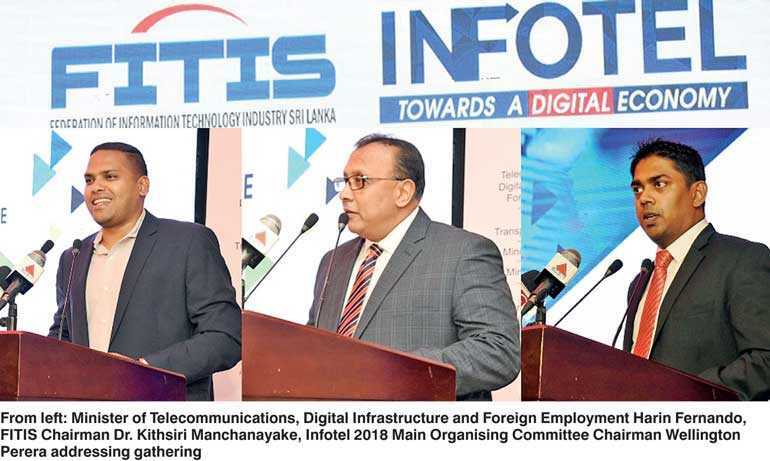 FITIS Chairman Dr. Kithsiri Manchanayake who was speaking at the launch of Infotel 2018, which took place at Kingsbury Hotel in Colombo, said the current workforce employed in the ICT Sector is closer to 80,000. FITIS will launch a few programs directly targeting these national objectives at Infotel 2018 National ICT Exhibition. He further said under the strategy they have identified 13 projects in various sectors and the three key sectors that have been identified were agriculture, tourism and manufacturing with plantations, fisheries also coming into the scene. Harin Fernando is also chairing the Steering Committee of Infotel 2018. Sri Lanka Telecom Group Chief Marketing Officer Ajantha Seneviratne was the keynote speaker at the forum and he delivered the keynote address on ‘Humanly Digital’. During his address he mentioned that Sri Lanka is only in the kindergarten of the digital economy. “Social and cultural transformation should go hand in hand with digitisation, otherwise we will fall back to square one,” he cautioned. The hurdles that digitisation must overcome are both socio-economic and sociopolitical challenges, Seneviratne added. FITIS organised the Infotel National ICT Exhibition since 1992 and Infotel 2018 is patronised by the government and private sector institutions. The Ministry of Telecommunication, Digital Infrastructure and Foreign Employment, Ministry of Defence, Ministry of Education, Ministry of Transport and Civil Aviation, Ministry of Tourism Development, Export Development Board, ICT Agency of Sri Lanka, Exports Development Board are the government organisations which have already extended their support to this biggest annual event in Sri Lanka’s ICT calendar. SLASSCOM, BCS Sri Lanka Section and CSSL are Industry Partners. Bhasha Lanka is the Digital Payment Partner, Pawara Concepts is the Digital Marketing and Web Partner, Vizuamatix is the Conference Solutions Partner, Omentra is the Official Procurement Partner. For more information on Infotel 2018 log on to website www.infotel.lk or email manager@fitis.lk.